This important design was devised by John Cuff, in 1744 at the suggestion of Henry Baker the well-known 18th century microscopist. The most significant innovation is in the composite side pillar, which gives rigidity, enabling the instrument to be provided with a delicate fine focus. 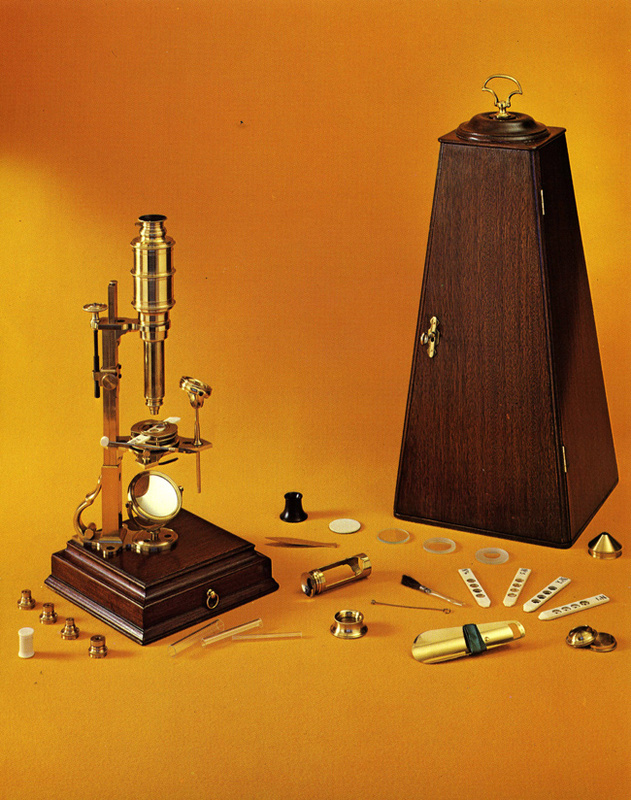 This instrument was reproduced from the original antique microscope in the McCormick Collection. The instrument foot, a 6 3/8" square box with accessory drawer, is made of oak, veneered with mahogany. The base pedestal, a composite brass pillar 9 7/8" tall, has a body mounting arm, 3 1/8" long, with a ring at the end. The fixed stage of a Maltese cross shape, has a 1 1/4" central recessed aperture, plus two stage openings, and two substage clips for accessories. A 1 3/4" single concave mirror is set in the optical axis. The 4" tall body, with 2 1/2" long nosepiece, has three ornamental ridges. The eyepiece has a sliding dust cap. The ocular is a biconvex doublet eye lens of 11/16" diameter and a second 1 1/4" diameter lens located near the middle ridge. The biconvex field lens is also 1 1/4". There are six objectives in brass mounts. Coarse adjustment is made by a sliding motion of the composite pillar. A long fine thread screw connecting the sliding block with the body mount arm gives fine adjustment. Accessories are a Bonanni stage, light cone, black and white ivory disc, 3 glass plates, Lieberkuhn sleeve and reflector, stage forceps, bull's eye condenser, live box, ebony mounted flea glass, fish plate, tweezers, 8 ivory talc boxes and a cleaning wire. The mahogany case (16 3/4" tall) with bottom drawer has a trade card in the back giving Cuff's address after 1757. The box foot base and closed instrument are 13" tall. Numbers 1 through 6 are engraved on the objectives and along the right hand side of the front pillar. Circling the central stage aperture is the inscription "J CUFF Londini Invt. & Fecit." The Replica Rara stamp and serial number appear on the pillar back.